A 63-inch sewer line broke June 20, sending waste into Miami-Dade County’s Biscayne Canal and Intracoastal Waterway. Although the “no contact with water” advisory for swimmers has since been lifted by the the water and sewer department, this incident is one of many disturbances impacting Biscayne Bay. 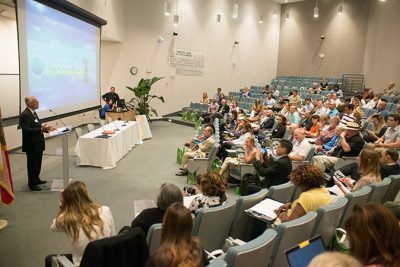 Members of the community, including FIU researchers, alumni and students, came together for the 2017 Biscayne Bay Marine Health Inaugural Summit. It was hosted June 28 at FIU’s Biscayne Bay Campus in North Miami, Fla.
Nearly 200 people representing local businesses, colleges and universities, governmental agencies and environmental nongovernmental organizations were in attendance. Their goal was to create and launch a 10-year action plan to reduce debris and pollutants in Biscayne Bay and local canals, rivers and beaches. FIU’s Institute of Water and Environment was one of the summit’s supporting partners. Institute researchers gave presentations and led workshops, including marine ecologist James Fourqurean, aquatic ecologist Evelyn Gaiser, geologist Rene Price, ecologist Joel Trexler and wetland ecologist Tiffany Troxler. The talks were designed to help stakeholders understand the ecological importance of and challenges to Biscayne Bay, identify its main sources of pollution, identify prevention efforts, establish collaboration among stakeholders, and share ideas, expertise, resources and solutions to support the creation and launch of the action plan. The institute was launched in 2016 to address water and environmental issues. It brings together some of FIU’s top centers and programs to expand research and community engagement opportunities in the face of growing environmental threats, including the Center for Aquatic Chemistry and Ecotoxicology, Marine Education and Research Initiative, Sea Level Solutions Center and Southeast Environmental Research Center, as well as Everglades programs and international water programs. Stretching 35 miles along South Florida’s Atlantic coast, Biscayne Bay is home to diverse marine plants and animals, including the threatened Florida manatee. Debris, fertilizers, pesticides, pollutants, sewer and storm water and other human-made disturbances impact its health. For Ross Boucek, Florida Keys Initiative Manager of Bonefish & Tarpon Trust, the summit was an opportunity to learn how to improve the health of Biscayne Bay, a lagoon that is home to ecologically and economically important bonefish, permit and tarpon. “There are a lot of environmental problems with Biscayne Bay, but there’s such a diversity of people working to improve the bay, from FIU researchers to municipalities and volunteers, something positive will get done. It’s very exciting to see everyone communicating and working together,” Boucek said. Boucek earned a Ph.D. in biological sciences from FIU. He has conducted extensive research on some of the South Florida’s most valuable recreational fisheries. The 2017 Biscayne Bay Marine Health Inaugural Summit was spearheaded by Luiz Rodrigues, founder and owner of Eco-Logical Solutions. It was also organized by Steve Sauls, former vice president for governmental relations at FIU; Dave Doebler, co-founder of VolunteerCleanup.Org; Albert Gomez, vice president and co-owner of Industrial Components; and Irela Bague, president and CEO of Bague Group. Be the first to comment on "South Florida comes together to help save Biscayne Bay"